Books to Movies Week: Before They Were Good Movies, They Were Good Books! | Read in Colour Read in Colour: Books to Movies Week: Before They Were Good Movies, They Were Good Books! Books to Movies Week: Before They Were Good Movies, They Were Good Books! Welcome to a new week and a new theme for the week! The contest prize from the other week, Orange Mint and Honey, got me to thinking about other books that have been made into movies. I've seen some that were much better than the movie and others that did the book no justice. I've put together a short list of the good, the bad and the meh. Premise: With their daughter leaving town for the holidays, the Kranks decide to forego the usual holiday hoopla in favor of a Caribbean cruise. Foolishness ensues when they receive a last minute call that their daughter is coming home for Christmas! The book and the movie were hilarious. John Grisham really made a great departure from his usual legal-based books. Premise: Stephen King is the king of macabre. He gets it right in books and it translates well into his movies. 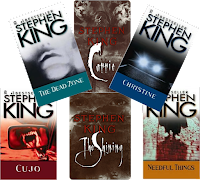 He plays an integral part in bringing his books to life in film and has been known to make appearances in several of them, including The Shining and The Stand. Premise: Alex Haley traces his family's history from 1750 in the African village of Juffure to 1960's Tennessee. As a child I remember being allowed to stay up past my bedtime to watch both of these groundbreaking miniseries. At my age it was difficult for me to grasp everything that I saw, but I never forgot it. On home for Christmas break in college, I picked up the book which had been on the family bookshelf for years. I devoured all 650+ pages in two days. It took me awhile to get the complete collection because The Next Generations wasn't released on DVD until 2007, but I'm proud to say I own it. Premise: I don't think I have to break this down for anyone. I know people that can quote the movie because they've seen it more times than they can count. It's a book, it's a movie, it's a musical, it's a movement! Premise: As beautiful in written form as it is on film, this is the story of a poor girl from a Japanese fishing village that finds herself working in a geisha house, first as a maid and then as a geisha. Chronicling her journey from servant to the most famous geisha in Kyoto, this story is simply remarkable. What good books have you read that have been made into good movies? And what about bad books that turned out to be good movies?